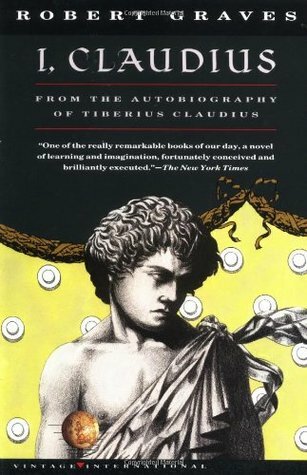 When I decided, a few years ago, to include I, Claudius on my list of books to read for the Classics Club I didn’t really expect to enjoy it. It was a book that I felt I should read, due to its status as a work of classic historical fiction, rather than one that I actually wanted to read. The reason I didn’t particularly want to read it was because Ancient Rome was not a setting I found very appealing. That has slowly begun to change since reading Robert Harris’ excellent Cicero trilogy in 2015 and then Margaret George’s The Confessions of Young Nero earlier this year. It’s probably a good thing, then, that I, Claudius has lingered on my Classics Club list until almost the end – it meant that when I did finally pick it up last month, I was much more receptive to it than I would have been a while ago. I, Tiberius Claudius Drusus Nero Germanicus This-that-and-the-other (for I shall not trouble you yet with all my titles) who was once, and not so long ago either, known to my friends and relatives and associates as “Claudius the Idiot”, or “That Claudius”, or “Claudius the Stammerer”, or “Clau-Clau-Claudius” or at best as “Poor Uncle Claudius”, am now about to write this strange history of my life; starting from my earliest childhood and continuing year by year until I reach the fateful point of change where, some eight years ago, at the age of fifty-one, I suddenly found myself caught in what I may call the “golden predicament” from which I have never since become disentangled. Claudius doesn’t actually tell us about his time as emperor in this novel – that will come later, in the sequel Claudius the God – but instead he gives us a very detailed account of his family background, his childhood and what it was like to live through the reigns of his three predecessors, Augustus, Tiberius and Caligula, who seemed to become progressively more corrupt, unstable and dangerous. However, it is obvious that the real power in Rome is wielded by Livia, the wife of Augustus (and Claudius’ grandmother) who systematically removes various rivals to the throne to ensure the succession of her own line. The ambitious, manipulative Livia is a great character and a constant presence throughout the novel as she works to control and shape the future of the Empire. Of course, life for someone part of the imperial family as Claudius is comes with its own set of dangers. With his stammering, his twitching and his limp, he is regarded as an embarrassment, kept in the background and not taken seriously as a possible contender for the throne. There are hints and omens from the beginning – including one memorable scene which takes place early in the novel involving a poetic prophecy spoken by a Sibyl – but otherwise the very qualities that appear to make Claudius unsuitable as an emperor seem to keep him safe as those around him are methodically poisoned, exiled or assassinated. This might not be entirely down to luck, though, as Graves has the historian Asinius Pollio advising Claudius to exaggerate these qualities as they could be his only means of survival. Although I did enjoy I, Claudius, it was a bit of a challenging read for me at times – but that was mainly due to the fact that I haven’t read a lot of fiction (or non-fiction, for that matter) about the Roman Empire so I only have a basic familiarity with the important events and people of the period. I wouldn’t say that it’s necessary to have any prior knowledge before starting this book, but it would certainly help! A piece of advice for future readers: you may find it useful to draw a family tree as you read, if your edition doesn’t already include one. The relationships between the characters quickly become very complicated, especially as so many of them marry and divorce several times, with children from each marriage (as well as adopted children) – but with a little bit of effort and attention, keeping track of the major players in the story isn’t too difficult. If I have a criticism of this book it would be that as Claudius spends most of his time telling us about events that happened before his birth, elsewhere in the Empire or in which he had no personal involvement, this occasionally takes away the sense of drama and immediacy that there could have been had our narrator always been at the heart of the action. It’s still quite gripping in places – such as the sequence of events leading up to the death of his cousin Postumus, or the ‘haunting’ of his brother Germanicus (two of the few people to actually show Claudius any kindness) – but it’s probably worth being aware that this is not just a book about Claudius himself but also the history of the Roman Empire in general (the real Claudius was a writer and historian so Graves’ decision to have him tell the story in this way feels authentic). I can’t comment on the accuracy of this novel, the sources Graves has used or the way he has chosen to interpret the characters, because I simply don’t know enough about the subject, but I do know that I found it much more enjoyable than I’d expected – and that I’m glad I decided to read it, despite my ambiguous feelings about Roman history. I’ll look forward to continuing the story soon with Claudius the God. I read this so long ago that I don’t remember the specifics. I think I was helped along by having seen the Masterpiece Theater series with Derek Jacobi. I’ve never watched the series, but I would like to see it now that I’ve read the book. This has been on my TBR as well forever and I did not read it because of the same reasons! Ancient Rome does not particularly fascinate me! But now I think I should get around to reading it…maybe I will finish it by end of Summer! I don’t think Ancient Rome will ever be my favourite period to read about, but I’m starting to find it much more interesting than I used to. I hope you enjoy I, Claudius if and when you do decide to read it! I read for the same reasons as you — and put it off for the same reasons! I did find it rather dense but as I got into the book I really began to enjoy it. Sadly, my edition didn’t have a family tree, I wish I’d drawn my own as I was reading. And I absolutely understood why Tony Soprano’s mother was named Livia after reading this book. Can’t have been an accident. Yes, definitely quite a dense book, but as you say, very enjoyable once you get into it! It seems like many of us are reading challenging stuff this late spring. Maybe we are all growing our brains! I’ll read The Confessions… in the following two months or so. Next year, I will be reading several Ancient Rome based novels as part of a theme; this one and its sequel among them. I will also be reading I am Livia by Phyllis T. Smith, The Twelve Caesars by Gayo Suetonio (nonfiction by a contemporary), and the Cicero trilogy. I’ll be interested to hear what you think of The Confessions, and your themed reading next year. Livia was a fascinating woman – I would like to read the Phyllis T. Smith book. I feel just as you did about this book, which is why I’ve never read it despite having a copy of the book since the TV series was on the first time around. I’m glad you ended up enjoying it. Books about Ancient Rome have never appealed to me at all until very recently. I’m glad I gave this one a try! I’m glad you enjoyed this too. My lack of knowledge of the period definitely made it a more challenging read, but I feel I’ve learned a lot from it. I agree with what you’ve said about the exploration of historiography – the story would have been very different if it had been told from another perspective or structured differently. And yes, I’m curious about Suetonius now too; it would be interesting to be able to compare his history to Robert Graves’ interpretation!